FQB "December Memoirs" Collection is a digital Christmas kit that is packed full with background papers and elements for card making, scrapbook layouts and mini albums but is also the perfect kit to use to journal your entire month of December. 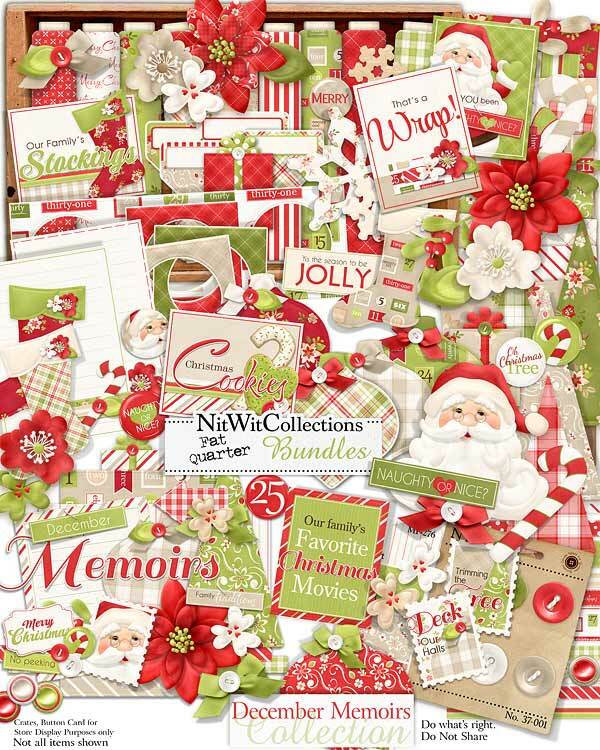 Included in this traditionally coloured digital Christmas kit are fantastic elements such as Christmas trees, snowflakes, decorations and presents but also many prefinished journal cards and blank journal squares that provide you with so many creative options that you will be able to create multiple personalized items with just this one kit! Take it all in Christmas lovers....you'll be sure to be on Santa's "Nice" list with the wonderful handmade creations you will make with this digital Collection. 4 Candy canes....no sugar added! 1 Flair element with "Naught or Nice?" written to remind you of something?? 6 Flowers in two differing styles and each in a different coordinating colour of this festive Christmas digital kit! 1 Journal Card - "Our Family's Stockings"
1 Journal Card - "Our Family's Favorite..."
1 Journal card - "That's a Wrap!" 1 Journal card - "Christmas Cookies"
1 Journal card - "Have you been Naughty or Nice?" 1 Blank label...should it be a present tag, a journaling area or a photo spot? You decide! 1 Label - "Tis the Season..."
1 Label - "Naught or Nice?" 1 Stamp - "Trimming the Tree"
1 Stamp - "Deck Our Halls"
4 Tabs with writeable top areas...recipe titles, journal highlights....how do you see using these?? 1 Title cluster - "December Memoirs"
5 Christmas Trees...Ok they're artificial and do not smell of pine...but boy are they cute! !